1. Preheat the grill to high. Season the pork loin steaks, lay them on a grill rack and cook for 10 minutes on each side, until nicely browned and completely cooked through with no pink meat. 2. Meanwhile, cook the potatoes in boiling water for 12 minutes. Add the beans and cook for a further 3 minutes until both vegetables are tender, then drain well. 3. While the vegetables are cooking, for the gremolata, heat the oil in a small pan and add the garlic. Cook gently for 30 seconds, without allowing it to brown. Remove from the heat, leave to cool for a few minutes then stir in the parsley and lemon zest. 4. 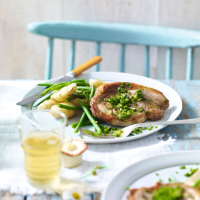 Arrange the pork and vegetables on 4 serving plates and spoon over the gremolata mixture. If you’ve got day-old bread in the bread bin, make it into breadcrumbs and toast under a hot grill until golden. Scatter a little over the gremolata pork just before serving, for added crunch.